All bullies are repugnant especially when they carry big golden sticks. ‘The bill which was passed is fundamentally flawed. The Executive Order is meaningless. Sr. Carol is mistaken in thinking that this is pro-life legislation,’ Cardinal George emphatically said. Chicago’s Cardinal Francis George, head of the United States Conference of Catholic Bishops, said last week that a group of American Catholic women religious broke ranks with the USCCB on health care reform in March 2010 and were therefore responsible for the passage of the Obama healthcare program. “Sister Carol and her colleagues are to blame,” announced Cardinal George. 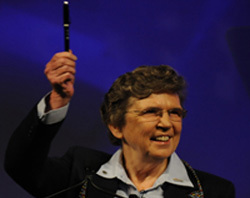 Sr. Carol Keehan waving the pen the President gave her. During the bishops’ executive session held last week on Tuesday morning, Cardinal George recounted the events that took place prior to President Obama’s signing of the health care reform bill. George then concluded his remarks by criticizing the Catholic Health Association and Sr. Keehan, saying they have created the dangerous precedent of a parallel magisterium to the bishops. Frankly, it is very clear that our bishops have problems with women, especially women religious. They remind me of the big bully down the street when I was growing up. When the fellow failed in football or flunked an exam he would physically beat-up his (star-athlete) sister and verbally abuse her in the school playground. Some guys, when they cannot live with reality, vent their own frustrations and their own shortcomings by bullying women. These days – as part of a living US Catholic history project — I am keeping a list of bishops who bully women. So this past week, we had Cardinal George (and a lot of other pointed-hat men) in St. Petersburg. Earlier this month we had Bishop Thomas Olmstead of Phoenix and his excommunication of Sister Margaret McBride. A year ago in March, Bishop Robert Morlino of the Madison Diocese questioned Ruth Kolpack about the master’s thesis she wrote in 2003 about using gender-inclusive language in liturgy. Morlino demanded that she renounce her thesis. When Kolpack declined to renounce her thesis because it would be academically dishonest, Morlino fired her. For the last 25 years, Ruth had been employed at St. Thomas the Apostle Parish in Beloit, Wisconsin, serving under four pastors and three bishops. Since 1995 she’d been a pastoral associate, working in religious education, liturgy and service to minorities, living out the teachings of the church. Ruth was fired after a 10-minute meeting with Bishop Robert Morlino. I invite readers of ANOTHER VOICE to send me their own bishop-bullying-women stories….. Bullying Aside — Did Cardinal George or Didn’t He? As the former chief legal counsel and lobbyist for the Catholic Healthcare Association, the long history of the CHA vis-a-vis the bishops is one of “bullying.” The stories are legion and Sr. Keenan’s (or those of her predecessor’s)with a Chicago cardinal run-in is not the first, or sadly the last. Remember Cody? of losing power and control to women. “parallel magisterium” – that’s what happens when the “official” one fails. It’s what happens when the “official” one abrogates its responsibility and the people lose respect for it. The current “official” magisterium has lost its credibility and its power to influence the “church” – that’s the rest of us. It is not the Bishop who is bullying women, but the dissident women who are bullying the Bishop. The Church, like all of our society, is split between liberal and conservative thinkers, and there are some very concrete issues of disagreement. The broader society, being a democracy, expects the majority to rule. Yet even there, it is not yet clear whether liberal or conservative thinking is in the majority. It’s still a very close call. However, the Church, being a private organization, is not subject to rule by majority, and in the Church, the liberals as clearly not yet a majority. So minority dissidents cannot expect to rule the Catholic Church. The Church does not aggressively ridicule the dissidents or call them bullies. But the dissidents are quite comfortable with aggression and name-calling. This speaks volumes about who might or might not be in the right. As a conservative-thinking Catholic woman, I am in absolute support of Bishop Morlino. I think that he is a great and holy man, and the fact that he does not allow aggressive liberals to change the rules of the Church is a mark of courageous accomplishment on his part. There is more than one form of feminism — and the radical aggressive feminists do not have the right to bully the Bishop of Madison in an effort to make him change the rules of the Catholic Church — an authority that he does not have, even if he did agree with the radical agenda. Numerous feminists are in absolute agreement with this Bishop and are grateful to him. May God bless Bishop Morlino richly for his courageous work! Thanks Madison Catholic for defending our bishop. Ruth Kolpack was given the chance to pledge to defend church teaching (which was her job), and to say that what she wrote in her thesis was mistaken insofar as it went against church teaching. She refused to do this–ergo, she refused to do what she was getting paid to do. She had no more right to keep her job teaching in the church than a Tea Party activist would have the right to keep his job as a high level official in the Democratic Party. If anything, that analogy does not go far enough since political platform items are negotiable but religious teachings are not. Those of us who supported Bishop Morlino’s decision wished Ms. Kolpack no ill will, and we’re all very happy that she was able to find another job in this poor economy. She is now working at a non-sectarian hospice center, a much more appropriate job for her. Also–good grief, Cardinal George as a bully? He’s one of the most mild-mannered center-right bishops out there, and many on the right think he’s too liberal. I think he’s just right. Jesus was comfortable with the counsel and companionship of women. Should not His successors follow His example? To our bishops: MORE LOVE! PLEASE! Beating women over the head offends their dignity, integrity, and sense of justice and makes them stand taller. Do women and men NOT have a right to their intellects and consciences? Would you make the Magisterium a modern-day Inquisition? Shame, Bishops George and Morlino! SHAME!! Jesus may have been comfortable with women, but he did not give women, nor men, nor even most apostles, the right to determine what is bound in heaven and the right to lead the Church. Same holds for the Catholic Church today. The Church is very comfortable with women (even those who may be wrong), but is not required to agree with all women and give all women whatever they demand. I am sure you would not accuse your lawyer, doctor, or any other professional who guides you, of being uncomfortable with women because they disagreed with your opinion and stood their professional ground! Nothing post facto about this case. Ruth was given the opportunity now to renounce her old statements from her thesis, and she declined. She apparently still opposes the teaching of the Catholic Church. So, how can a person who openly opposes the teachings of the Catholic Church demand employment from the Catholic Church, in a teaching position, no less?!?! Radical feminists should stop whining and should found their own institution where their ideas are more welcome, instead trying to hijack and harass institutions which do not welcome their ill-founded radical ideas. Numerous women today welcome the teachings of the Catholic Church and do NOT welcome radical feminism at all (http://sytereitz.com/2010/08/feminism-updated/ ).